Super Eagles former defender, Efe Sodje and two of his brothers have been jailed for siphoning tens of thousands of pounds from a charity set up to help poor African children. 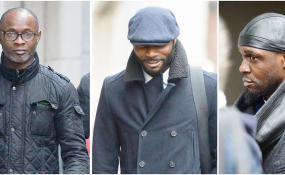 Efe, 46, fellow footballer Stephen Sodje, 43, and ex-rugby player, Bright Sodje, 52, were condemned by a judge for bringing "shame on their family" as they were convicted of milking their own fundraising campaign, the Sodje Sports Foundation (SSF). The brothers' convictions in 2017 can only now be reported at the conclusion of a separate money laundering case involving the former Nigeria and Reading defender Sam Sodje, 39, who was cleared. Efe - a journeyman defender with Crewe, Huddersfield and Bury - and his two brothers set up the charity in 2009 to help provide sporting facilities to youngsters in Nigeria, but the brothers are believed to have milked much of the cash raised at black tie dinners, auctions, charity football matches and a clay pigeon shoot. Ashley Carson, a businessman and director of Sheffield Wednesday Football Club, and one of the city's MPs, Clive Betts, were recruited to give the charity respectability, but when they asked for bank statements and financial reports, they were fobbed off. Once the pair resigned as trustees and directors in 2013, "the amount of money being transferred to the Sodje family increased dramatically", prosecutor Julian Christopher QC told the Old Bailey. Efe handed out Easter eggs - provided by the hospital - to child cancer patients, while five Sodje brothers attended a £150-a-head black tie dinner. The event raised almost £11,500, but Mr Christopher said: "Not a penny went to the Royal Manchester Children's Hospital." Stephen, of Bexley, was sentenced to two years and six months in prison. The judge said he lied repeatedly to the jury and was a "self-regarding and arrogant man with a strong sense of self-entitlement". Father-of-one Efe, who was "the face" of the charity, was given 18 months in jail, having received around £7,500 plus an unknown amount of cash from the clay pigeon shoot. Bright, of Sale, Greater Manchester, was jailed for 21 months for his part in "milking the charity".